A Radio App for Linux , why yet another one? 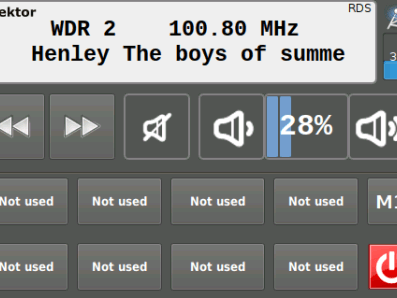 Well, if you look around for Radio Apps you will soon find KRadio, Gnomeradio or RDS-Surveyer. Or you will find some TV-Apps that can also be used to listen to some radio. Every app has its strengths and weaknesses, but for use with IR-remote and touch display they all are beyond optimal. They were built with a desktop system, mouse and keyboard in mind. On a small 3.5” low resolution touch screen, they are hard to use, and without any kind of keyboard you may be lost. The first one tells which command interpreter to use. The second kills all running irxevent and the third starts it again. The last line will execute the piRadio with the parameter “platform xcb” and tells Qt to use the X11 for displaying things as our desktop does. Another way with Qt can be to use OpenGL ( hardware accelerated graphics ) without interacting with the desktop. As we want to have a desktop app running aside everything else, we stay with the xcb approach. The UI is designed to work best with a 3.5” TFT with 480 * 320 pixels, like the Waveshare35a and controlled by a touchscreen or a IR-remote, also we added a small sample webpage to show how to control the app via a web browser. We developed the app using QT Version 5.10.1 and if you want to have a look inside, the app is open source and the code is provided under downloads. The display shows in the top right corner if we are receiving RDS information, the decoded station name will be added in front of the current tuned frequency. In the second line you will see the current text. If only the station name could be decoded, the display shows one line with a lager font for better readability. 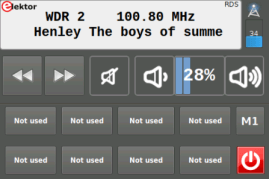 If no RDS information will be received only the current used frequency is displayed. In the lower section you can see eight buttons which have the value “Not used” in the default configuration. This is the station memory, displaying eight buttons per page. With the M[x] button, here M1 currently, you can change the page that is displayed. In the default configuration you have four pages, meaning 32 station memories. With the remote or keyboard you can access the station memory by pressing [xy] on the remote, where x is the station page and y the station number. For example to get the second station of the first page press 12, for the fourth station of the second page use 24. Page one is special as you don’t need to press the 1 first. If you just press 1 to 8 and wait for one second, the station stored in page 1 will be accessed. What if you use [0y] to access something. Well in this case you choose from the current page a station. If you grab a station memory that doesn’t exist, or has no station stored, the radio won’t change the frequency. As a side note, radio will display the currently selected page. But if there are no stations stored how to do this? Well that is pretty simple, but only possible with the touch screen. Select the page you like to store the station by pressing the M[x] button as long as you arrive at the desired page. Afterwards hold the station button where you want to store the station for at least 5 seconds. In the display a bookmark star will appear to signal that the station is stored. A small example with some Information and some interaction is provided a starting point. On the provided image a nginx is set up to provide a demo page. The code for the page can be found as download. "VOLUME_UP”, "VOLUME_DOWN", "FREQUENCY_INC”, "FREQUENCY_DEC”, "SEEK_UP”, "SEEK_DOWN”, "MUTE_TOGGLE” . All this commands have no parameter. There are currently two commands that have parameter, these are "FREQUENCY_SET” with "Freq" for the desired frequency in 1/s (Hz) and "CHANNEL" with "Ch" for the desired channel. This gives you control over most of the basic functions. Besides commands you get new data from the piRadio. This includes the current frequency, volume, RDS Data as Raw Blocks and Raw Messages. Also you get the decoded radio text and station name and current signal strength reported. Messages are delivered with the following object keys: “VOLUME”, “RDS_STATION”, “RDS_TEXT”, “FREQUENCY”, “RSSI”, “RDS_RAW”, and “RDS_MESSAGE”. The RDS data allows you to develop your own decoder and decode the other messages the piRadio currently ignores. As an development environment an text editor for the web part and a browser for debugging is all you need. In a further version of the software there may be more data and commands that can be modified. Also you can have a look at the websocket part in the radio itself and add missing features yourself. The source is available so feel free to play around with it. The Waveshare35 LCD is used in many of our projects. As setting it up to work shall not be “back magic”, we will show you how to get it running the fast way. You will need a few files for it, and if you are on windows, we need some extra Software. We will modify the SD-Card directly, at least for the boot partition. Here we need to store the “waveshare35a.dtb”. To retrieve it grab it from ‘https://www.waveshare.com/w/upload/3/34/LCD-show-180331.tar.gz’ and extract it. Copy the “waveshare35a-overlay.dtb” to “/boot/overlay/waveshare35a.dtb” on your SD-Card. Now the SPI interface for the Display is active. That is what enables the hardware. We now need to modify some files inside the EXT4 Partition. As windows has no onboard tools for modifying these files, we need to boot the SD-Card now. In Linux this is much easier. The pi must be connected to your network and you must know it’s ip address, also you must have ssh enabled,via raspi-config. You can find it under Interfacing options. Go to SSH and enable it. Now you can open WinSCP and do a connect to your pi. Put the files “40-libinput.con” and the “99-fbturbo.con” to a usb stick and mount it. Copy the provided “40-libinput.con” and the “99-fbturbo.con” to “/usr/share/X11/xorg.conf.d” as root. Unmount the USB-Stick and reboot the pi. The Desktop will appear on the LCD and touch will work. Mount the SD-Card and copy the provided “40-libinput.conf” and the “99-fbturbo.conf” to “/usr/share/X11/xorg.conf.d” as root. Unmount the sd-card and put it back to the pi. If you now boot, you shall see the desktop on the tft and the touch shall work as expected. These two files have been generated using some tools. Here we will show what the magic is inside. This will make the desktop appear on our tft screen on top of the pi, as we tell X11 to use the Frame buffer 1 instead of 0, being 0 the internal GPU and the 1 being the TFT. Option "TransformationMatrix" "-0.003070 -1.113659 1.064514 1.118580 -0.004042 -0.077240 0 0 1"
This will apply to any touch point the screen reports the matrix and transform the coordinates to match with the desired pixel. If you rotate the screen you have to redo the transformation matrix. Using this matrix is the new way of doing a calibration. To build xtcal you need some libraries on the pi and you have to use some console commands. to use it open an terminal an type in the xtcal folder: ./xtcal -geometry 480x320. Please be aware that you must hide in LXDE the top bar in LXDE to get correct results. In the terminal you get the line to add to the “40-libinput.conf”. 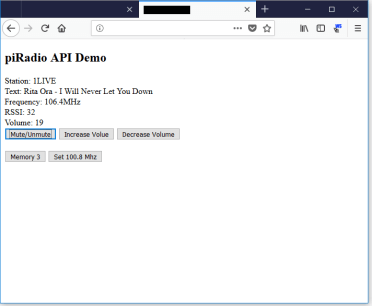 You can easily hook an IR receiver up to your pi, the FM Radio Receiver with RDS for Raspberry Pi provides one. From the schematic you can see that the IR receiver is hook to pin 26. To get the receiver working we need a little help from the software side. This is done with the help of LIRC ( Linux Infrared Remote Control ) and with some lines in the config.txt in /boot. To install lirc open a terminal and type “sudo apt install lirc” to get the required packages. To make the receiver working add the line “dtoverlay=gpio_ir,gpio_in_pin=26, gpio_in_pull=up” at the end of the file. This tells the pi to load the appropriate module and use pin 26 as IR input with pullup. At this point LIRC is not working, and we need to change /etc/lirc/lirc_options.conf . We must edit the line with “driver” to “driver = default” and “device” to “device = /dev/lirc0” . At this point the basic steps are done, but LIRC has no idea what to do with the IR signals.